If Sierra Leone’s President Ernest Bai Koroma ever required further proof that the depth , intensity and fervency of the love Sierra Leoneans have for him back home is equal to the tremendous love beating in the hearts of diasporans , the crusading President got the answers once again last Saturday when he arrived in New Jersey on a one-day visit . The President was virtually mobbed by enthusiastic Sierra Leoneans who came out in full colours to receive him. President Koroma , who is in the U.S. to attend the 66th Session of the United Nations General Assembly , was invited by the New Jersey Chapter of the ruling All People’s Congress ( APC ) and the North American Branch of the party for a Retreat and Banquet –and if the outpouring of love and appreciation the President received is anything to go by, President Koroma is safely the most loved Head of State Sierra Leoneans have ever had in 50 years of nationhood. Never before has any Sierra Leonean president or Head of State received such an overwhelming support and welcome from diasporans. during visits to the U.S . Just a week after he was literally mobbed in Downtown Freetown by surging crowds when he made one of his unannounced visits to the city centre, President Koroma had cause once more to savour how much his people love him , this time in New Jersey. As he and his delegation alighted from their motorcade that drove them in from New York , the whole atmosphere around the Round Tree Hotel at Davidson Avenue, Somerset, where the welcoming ceremony was held and where the President and delegation stayed , was converted into a seething holiday carnival of festive excitement as Sierra Leoneans demonstrated to President Koroma that they really love him for the positive changes he is bringing to the socio-economic and political landscape in their country. Citizens waving small flags , many of them dressed in the red colours of the APC , screamed repeatedly : “Welcome, Mr. President ! ! We love you ! ! !” .The Secret Service and Police had problems keeping the crowd still during the welcoming ceremony which consisted of the playing of the national anthems of Sierra Leone and the United States, a welcome address by the Mayor of Franklin Township, Mr. Brian Levine , who along with other top-ranking officials of the township , received the President on arrival ,and a response by President Koroma which was greeted repeated by earsplitting applause . President Koroma later in the evening attended a huge Banquet staged by the APC at the Ukranian Cultural Centre at the same Davidson Avenue. Amidst our very busy schedule , while waiting to publish full reports of the events, we bring you some pictorial highlights of President Koroma’s visit to New Jersey . It will be the first of many reports and pictorials on the New Jersey visit. 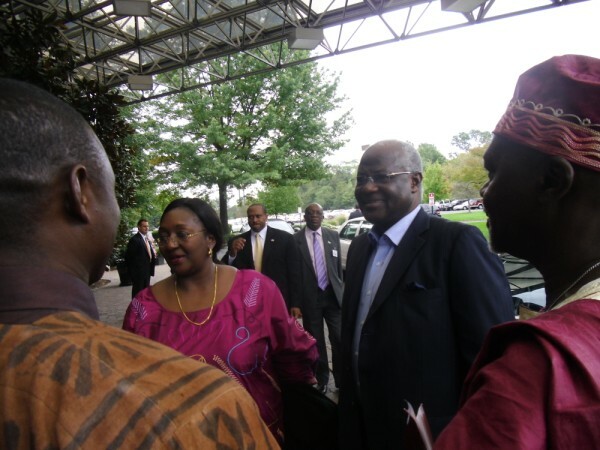 PRESIDENT KOROMA AND THE FIRST LADY, MRS.SIA NYAMA KOROMA , ARRIVING IN NEW JERSEY : THEY ARE BEING WELCOMED BY THE CHAIRMAN OF THE APC -NA , MR.AZIZ TURAY (LEFT ) AND NEW JERSEY CHAPTER PRESIDENT MR. ALLIE BADARA KAMARA. FROM LEFT : MR. FODAY MANSARAY AND PA. AZIZ NABE–TWO OF THE KEY ORGANIZERS OF THE PRESIDENT’S VISIT–POSE WITH THE HEAD OF STATE YESTERDAY AT HIS HOTEL BEFORE THE PRESIDENT LEFT FOR BOSTON. WE HAVE VOLUMES OF PHOTOS AND WILL PUBLISH THEM INCREMENTALLY AS CHANCE PERMITS US. IF YOU WERE IN NEW JERSEY AND DID NOT APPEAR IN THESE FIRST SET OF PHOTOS, DO NOT DESPAIR. MORE PHOTOS ARE COMING.